Compression-only CPR, performed by providing continuous chest compressions without stopping to provide ventilations, has been proven effective in treating patients with sudden cardiac arrest. This practice is effective because it circulates unused oxygen left in the patient’s lungs to the body’s vital organs. There are additional benefits to compression-only CPR. 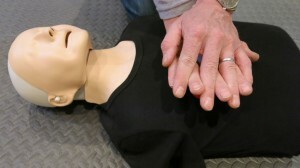 There are fewer steps than traditional CPR, making it easier for rescuers to remember them and for emergency dispatch personnel to instruct over the phone. Additionally, those fearing disease transmission may feel more comfortable providing chest compressions without rescue breaths. Without a doubt, providing compression-only CPR is better in an emergency than doing nothing at all. Compression-only CPR training is not designed to meet workplace CPR requirements. 1 hour – We hold weekday, evening and weekend courses.